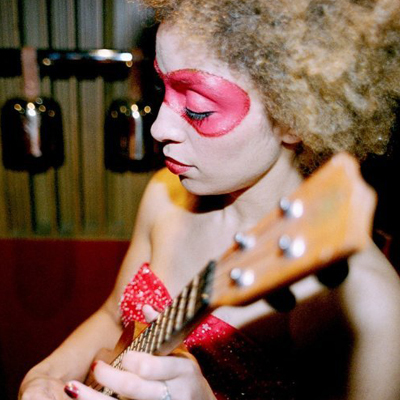 Martina Topley-Bird — brought to attention by Tricky and presently wowing audiences as Massive Attack’s featured vocalist, reworks her first two albums, Anything and The Blue God, on Some Place Simple. Functioning as an unplugged and/or live album of sorts, Some Place Simple strips Topley-Bird’s songs to their bare bones, much like her supporting performances on the current Massive Attack tour. Topley-Bird’s voice is accompanied by the odd piano plinks, drum taps, and tinkling chimes. “Baby Blue” is lullaby-like with the hoarse plucks of a ukulele tugging at Topley-Bird’s easy croon. Percussion on “Lying” thumps organically, pulsating with Topley-Bird’s sugary delivery. On “Ilya” Topley-Bird carries the minimal sounds with only layers of vocals and no instrumentation other than the odd finger-snap or tongue cluck. On “Sandpaper Kisses” Topley-Bird’s voice whispers softly and chillingly on its own. It is then pushed to the side as a grinding guitar takes over. Pulling back, it leaves her voice as the main focus. The four new tracks on Some Place Simple follow this unadorned formula — a hopeful direction for her next album. Buy this at Other Music or iTunes. After the jump, check out Massive Attack’s video for “Psyche”, featuring Topley-Bird.